The global sodium chloride market was valued at US$ 15,951.26 Mn in 2017 and is anticipated to expand at a CAGR of 3.8% from 2018 to 2026, according to a new report titled ‘Sodium Chloride Market: Global Industry Analysis, Size, Share, Growth, Trends, and Forecast, 2018–2026,’ published by Transparency Market Research (TMR). The global sodium chloride market is driven by the rise in the increase in application of sodium chloride in various end-use applications such as chemical intermediates and and de-icing. Sodium chloride is used as salt in various applications. The chemical industry is the major consumer of salt for chlor-alkali products such as chlorine, soda ash, and caustic soda. Chlor-alkali products are used to manufacture various end-use products such as polyvinyl chloride (PVC), glass, dyes, detergents, and soaps. Chlor-alkali products of salts are significantly used as primary feedstock in the chemical industry. Salt acts as an ion-exchange resin, which helps soften the water used in water treatment plants. The number of gourmet restaurants across the world is anticipated to increase substantially in the next few years due to the rise in disposable income and change in food habits of consumers. Rise in the number of exotic food businesses is anticipated to fuel the demand for gourmet salts such as fleur de sel, sel gris, flake, and Himalayan salt due to their properties such as color and flavor. The use of salt as a flavoring agent and natural food preservative is expected to rise during the forecast period due to the growth in the food & beverages industry. Based on grade, the sodium chloride market has been segmented into rock salt, solar salt, and others (brine & vacuum). Others is expected to be the major segment of the market during the forecast period. The mechanical method used to vaporize brine to obtain crystalized salt at controlled thermal conditions is called vacuum evaporation. The salt obtained through this method is known as evaporated salt or vacuum-evaporated salt. Easy availability and low-cost feature of the salt are boosting the others segment of the sodium chloride market. 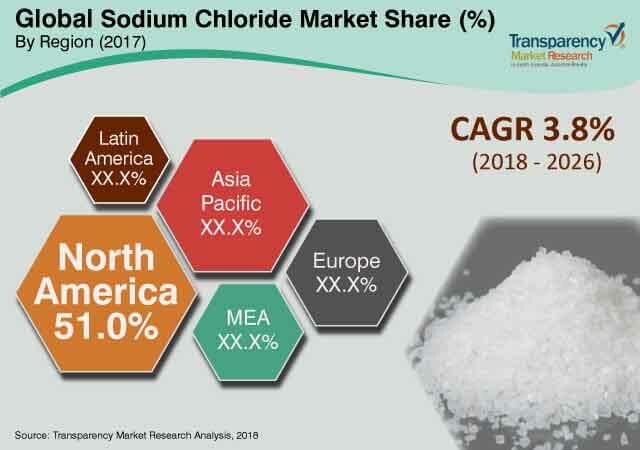 Based on region, the global sodium chloride market has been classified into North America, Europe, Asia Pacific, Middle East & Africa, and Latin America. Asia Pacific is estimated to be the leading region of the sodium chloride market during the forecast period. Growth in the chemical industry has propelled the demand for chlor-alkali products such as chlorine, caustic soda, and soda ash. Commercially, salt is used as a primary source for chlorine and sodium hydroxide production, as it is extensively available and inexpensive. Chlorine is used in various industries, such as textile, plastics, agrochemicals, and chemicals, to manufacture consumer products such as papers, paints & coatings, pharmaceuticals, PVC, plastic & rubber products, insecticides, and soaps & detergents. Emerging economies in Asia Pacific such as China and India are major producers and consumers of chlor-alkali products. Growth in the chemical industry is boosting the consumption of chlor-alkali. This, in turn, is augmenting the demand for sodium chloride. Furthermore, increase in adoption of packaged food and change in food habit are boosting the demand for sodium chloride in food preservation applications. High degree of competition exists among market players operating in the sodium chloride market. The market is moderately consolidated. It is dominated by large players. Key players account for major share of the market. Prominent players profiled in the report are Akzo Nobel N.V., Cargill, Incorporated, Compass Minerals International, Inc., K+S AKTIENGESELLSCHAFT, Tata Chemicals Limited, Wacker Chemie AG, Südwestdeutsche Salzwerke AG, The Henrique Lage Salineira do Nordeste, INEOS Salts, Maldon Crystal Salt Co., Dampier Salt Limited, Swiss Salt Works AG, Cheetham Salt, and Dominion Salt.